"It's getting dark. Too dark to see. 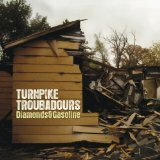 Feels like I'm knockin' on heaven's door"
Diamonds & Gasoline (this album) (2010). Sorry, no matches on eBay for "Evangeline Turnpike Troubadours".